Head of the Fair Russia party, presidential candidate Sergey Mironov has suggested that the party with the majority in parliament could suggest its candidate for the prime minister’s post, but the nominee must still be approved by the president. Mironov made this suggestion at Wednesday’s meeting between President Medvedev and the heads of leading Russian political parties. 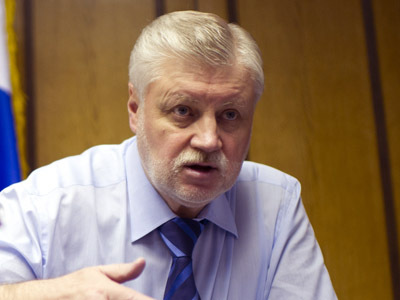 “I think that we should give more powers to the parliament without affecting Russia’s constitutional definition as parliamentary republic, and without challenging the right of the head of state to submit the PM’s candidacy to the State Duma, to set up a legislative opportunity of the party that wins the parliamentary election to suggest to the president their candidate for the prime minister’s post,” Mironov said. At present, the president puts his candidate for the premier’s post to the parliament for approval, and has the right to dissolve parliament if the deputies reject his nominee three times. Mironov said the parliamentary parties’ capabilities could be further boosted through the creation of parliamentary commissions, and broadening of the list of areas, in which the lower house can launch investigations. Russian law currently allows MPs to launch parliamentary probes into blatant violations of constitutional rights and freedoms, and into emergency situations, both manmade and acts of God. Mironov suggested that parliamentarians also receive the right to investigate cases of power abuse by members of the government, parliamentarians, governors, high-ranking officials from law enforcement and special services, and top executives of business corporations owned by the state.